The contorted object captured by Hubble in this cool space wallpaper is IRAS 22491-1808, also known as the South America Galaxy. It is an ultraluminous infrared galaxy (ULIRG) that emits a huge amount of light at infrared wavelengths. The contorted object captured by Hubble in this cool space wallpaper is IRAS 22491-1808, also known as the South America Galaxy. It is an ultraluminous infrared galaxy (ULIRG) that emits a huge amount of light at infrared wavelengths. 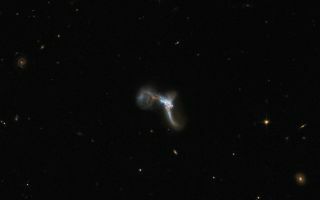 The reason for this intense infrared emission lies in an episode of strong star formation activity, which was set off by a collision between two interacting galaxies. This image was released June 10, 2013.